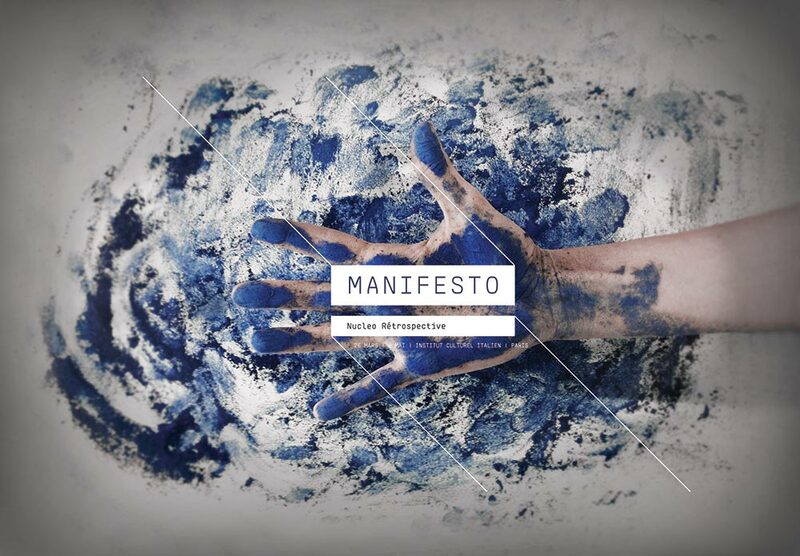 The Italian Institute of Culture in Paris is proud to present from March 26th to May 6th the first important retrospective on NUCLEO, the art and design collective led by Piergiorgio Robino. The exhibition was conceived and realised by the Nilufar Gallery of Milan, and curated by Elena Giulia Abbiatici and Melania Rossi. It was set up under the “Promises of Art” program, which aims to promote young talents from the ultra-contemporary Italian art scene. 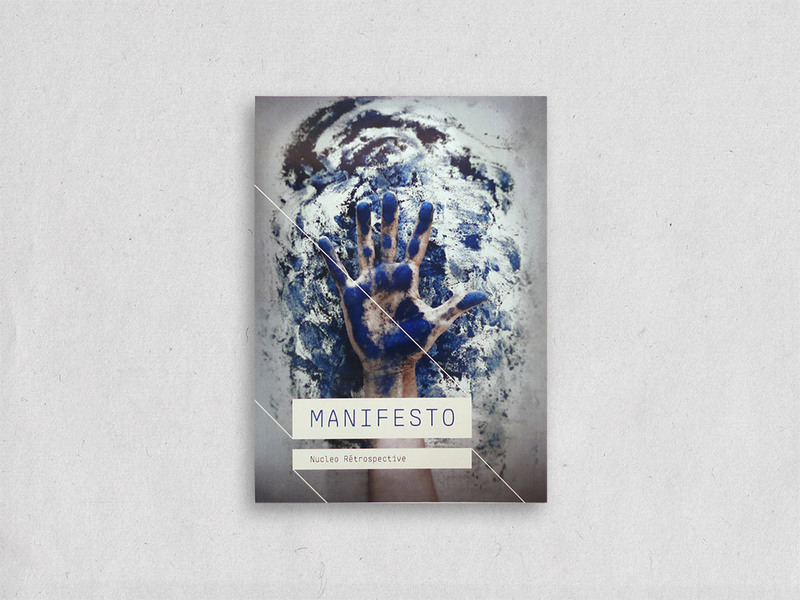 Manifesto tells the story of a group and its assertions. This is not propaganda. It’s a second reading, a proposition. It is a thought which translates into action, a meeting at the peak of artisanal and artistic research. 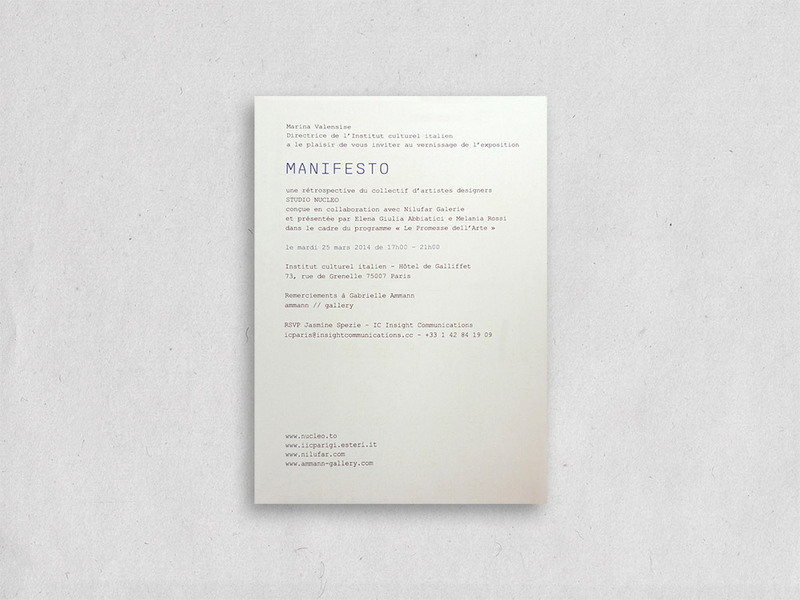 The collective meaning of Manifesto is completed by presenting a series of everyday objects – Manifesto, concludes by exploring the evolution and the research innate in visible products. The syntax of lexicon is thus made tangible, tied as it were to the process of invention and creation of objects. NUCLEO’s work is simultaneously material and conceptual: molded by many hands, it has the ambition to combine three forms of knowledge – theory, practice and production (theoria, pràxis e poiesis). The 15 works on show in the Hôtel de Galliffet are of different formats, all realised with various techniques developed during the past five years. The NUCLEO retrospective will also be the occasion to present Carboniferous, a work commissioned by the committee for the Unification of Italy Sesquicentennial Celebrations. NUCLEO, a studio collective founded and directed by Piergiorgio Robino, is based in Turin. Since 2004 Alice Carlotta Occleppo, Stefania Fersini, Alexandra Denton and other collaborators – artists, designers and artisans chosen to give projects an artisanal form – have also participated in the creations of NUCLEO. The works presented on the occasion of this retrospective are made in resin, wood and metal, which all have a common ground in history conceived in its complete form of past, present and future, that is then manipulated and folded in accordance with creation, investigating Mankind through Time. NUCLEO’s research is expressed in every artefact, explicating the original and three dimensional material aspects that are innate in everyday objects. “Terra !” and “Angelica’”, the first works imprinted by industrial design, are a testimony of strong project experimentation. In 2002, “Terra !”, the grass armchair designed with Andrea Sanna, was exhibited at the Centre Georges Pompidou in Paris and at the Minneapolis Walker Art Center in 2003. In the same years, NUCLEO’s projects were selected for important international design awards, including the Golden Compass. In 2009, “Primitive”, the first of a series of works realized entirely by hand, was presented at the Sandretto Re Baudengo Foundation in Turin. NUCLEO projects have been exhibited in Italy (Re Rebaudengo Foundation, Turin, 2009), France (Centre Georges Pompidou, Paris 2004), Belgium (Pierre Bergé and Associates, Brussels, 2008), Spain (Marco Museum of Contemporary Art, Vigo, 2005), Germany (Gabrielle Ammann Gallery, Colonia, 2013), Brazil (Museu Nacional do Conjunto Cultural da Repùblica, Brasilia, 2008), Denmark (ID Forum, Horsens, 2006), in the USA (Carnegie Museum of Art, Carnegie, 2004 ; Chelsea Art Museum, New York, 2004; Walker Art Center, Minneapolis, 2003), and in all main design and art fairs: Design Miami Basel, PAD Paris, PAD London, PAD New York. Nilufar Gallery, founded by Nina Yashar, has been a landmark for all historical design lovers, as well as those who follow the evolution of contemporary design, in particular in the poetic, visionary and cultured area that moves between production and contemporary art. Elena Giulia Abbiatici and Melania Rossi are art historians and independent curators who work on the border between different artistic expressions. They write for magazines and contemporary art catalogues and are active as curators of exhibitions and art prizes.